As an executive of the Grand Bahama Shipyard told Seatrade Cruise review recently, lines have been adding extra cabins to their ships that can generate an extra $100,000 each in gross revenues to the line. This Saturday saw seven ships calling at Croatia's popular Adriatic port of Dubrovnik. And the Great Lakes see their number of planned cruise ships diminish. As an executive of the Freeport's' Grand Bahama Shipyard told Seatrade Cruise Review recently, for the extra cabins it has been adding to Holland America Line's Statendam and Rotterdam class ships, the potential revenue to the line is in the order of $100,000 annually per cabin. This will be true of course for every double-occupancy cabin that can generate $1,000 per passenger per week. And if less, there is still the onboard spend generated by increasing passenger numbers. This applies equally well of course to newbuildings. Let's have a look for a start at the latest generation of Holland America cruise ships. On its most recent Panamax platform, the line has slowly added extra cabins to each ship since the Zuiderdam and Oosterdam of 2002 and 2003, so that the latest pair, Eurodam and Nieuw Amsterdam (which even has an extra cabin over her sister) have more than 125 cabins more, which has unfortunately resulted in a squared off profile aft where once were tiered decks. Over at sister company Cunard Line, with its longer Queens on a similar platform, this month's Queen Elizabeth will have thirty-nine more cabins than her near-sister Queen Victoria of 2007, and once more a square stern than should produce almost $4 million more a year rather than the more appealing tiered decks of the Queen Victoria. Equally, Norwegian Cruise Line has been incrementally increasing the passenger capacities of its new ships as they have been produced for the past decade, adding another 111 cabins between its Norwegian Star of 2001 and Norwegian Jade in 2008. These are just three examples of lines maximizing their passenger cabin count on a single platform but there are many more examples of existing ships having further cabins added to increase revenue potential. In particular Holland America has been replacing swimming pools with cabin spaces below, even if they are inside cabins. Even in the autumn, Mediterranean ports can be crowded. This Saturday saw seven ships in the port of Dubrovnik, whose old town has seen a huge increase in both interest and business since that country achieved independence. Ships that berthed on Saturday included the MSC Musica, Discovery, Delphin Voyager and Island Sky, with the Crystal Serenity at anchor off port and Royal Clipper and Le Boreal directly off the old town. 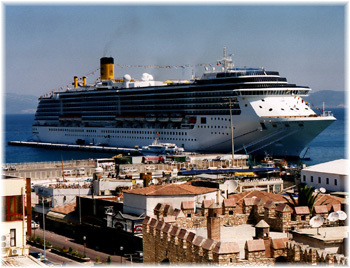 Totally, these seven ships had a capacity of 5,586 passengers that crowded the quite small old town with tourists. One ship alone, the MSC Musica, had 2,550 lower berths and can carry in excess of 3,000. However, the port has handled as many as eleven ships at once in the past and is now taking steps to limit the number of ships calling on the same day so that the experience is not dimished by crowding. If not watched closely, in general terms, this could become a problem in many European ports, as it has in the Caribbean, especially as not only more Europeans go cruising but more Americans return and the size of ships increases. Europeans that go cruising have jumped from 3.2 million in 2005 to almost 5 million in 2009, 75% of whom cruised within Europe, while the number of Americans cruising in Europe has also seen a large jump, numbering in the millions as well. But it's popular destinations such as the Greek Isles and smaller ports that need to be watched, especially now that Greek ports have also been opened to non-Greek cruise lines. The same applies of course in popular western Mediterranean ports. No sooner had Cruise West gone out of business last month and the Great Lakes lost a planned 2011 season by its mooted 108-berth Spirit of America, now laid up in Seattle as the Spirit of Glacier Bay, than last week Pearl Seas Cruises refused to take delivery of the 234-berth Pearl Mist, completed last year by Halifax Shipyards and now laid up at Shelburne, NS. The Pearl Mist had been scheduled for a number of Great Lakes cruises between Toronto and Chicago in 2011. It had been expected that the Spirit of America and Pearl Mist would have made up for the slack created this summer when Travel Dynamics withdrew from Great Lakes cruising after having disposed of its 100-berth Clelia II to Orion Expedition Cruises of Australia. 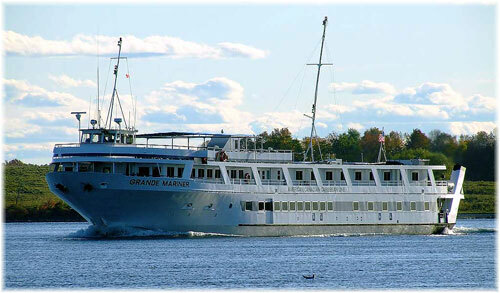 Good news, however, comes from Blount Small Ship Adventures, previously American Canadian Caribean Line, which this summer expanded its Great Lakes offerings, with a new series of canal and lake cruises between New York and Toronto, as well as lake cruises between Toronto and Midland, on Georgian Bay, with the 100-berth Grande Mariner. Other speculation has been caused by reports that Hapag-Lloyd Cruises' 420-berth Columbus, which is scheduled to return to the Great Lakes for a sold out season in 2011, has been offered for sale by brokers in Norway. However, since the Columbus is actually owned by a German investment company and chartered to Hapag-Lloyd, this does not necessarily mean that Hapag-Lloyd will be disposing of the ship. However, in her last Great Lakes season in 2007, as the Columbus had problems with Department of Homeland Security bureaucrats that impacted on her smooth operation, as well as having low water difficulties at some lakes ports, the authorities there will have to be careful to retain their interest. Meanwhile, a black horse in the future of Great Lakes cruising is the laid up steamship Norisle, a vessel that may be revived to carry 50 or 60 passengers on overnight cruises. The 1.400-ton vessel is a former Manitoulin Island ferry that has been laid up on Manitoulin Island for more than three decades. Her near sister ship Norgoma, which used to cruise in Georgian Bay, is now a museum ship at Sault Ste Marie.